A year ago, I was in Costa Rica for a surf trip. And like most trips I’ve been on, the main goal (surfing) was the least memorable of the trip. Sure the waves were incredible, and the surfing was insane, but this was my first tropical trip since my college spring breaks. So much of this landscape and wildlife differed from the mountain climates I had been so accustomed to traveling in. The rocky peaks were replaced by thick, tropical vegetation. And the occasional alpine flower was replaced with beautiful, vibrant flowers. And don’t even get me started on the wildlife. The fish, the birds, and the howler monkeys! Throughout the first half of the trip, I could hear them all over the place. Lurking around in the jungle, high up in the trees. Their call is distinct, and unable to be missed. It’s deep, loud, and their sounds carries far across the landscape. As we drove towards the coast, I began to see their outlines climbing in the trees above the tiny towns we passed. It wasn’t until I was sitting on the deck of the house we were renting when I finally saw one up close! A monkey was climbing along the telephone wires right in front of me. Quickly, I ran inside, wrangled up the troops (pun intended), and headed down to the beach to follow the monkey. Howler monkeys are among the largest of the New World Monkeys, most notably famous for their hows that can travel up to 3 miles in dense rainforest. They are native to South and Central American forests. Fortunately for us, howlers are seldom aggressive towards humans. And this allowed us to get pretty close to them as they climbed overhead. I don’t know if it was coincidence, or just the right time of day, but there were tons of monkeys. They were hanging out on the power-lines, in the trees that lined the streets, and just sitting on the fence of the beachfront homes. This was a truly wild sight to see. Normally, when out in nature, as soon as an animal sees you, they bolt as fast as they can. These monkeys were so used to dealing with and coexisting with humans, they just stared back equally as long as we were. So when I looked up into the tree, peering through my lens, I noticed this particular monkey wasn’t alone. 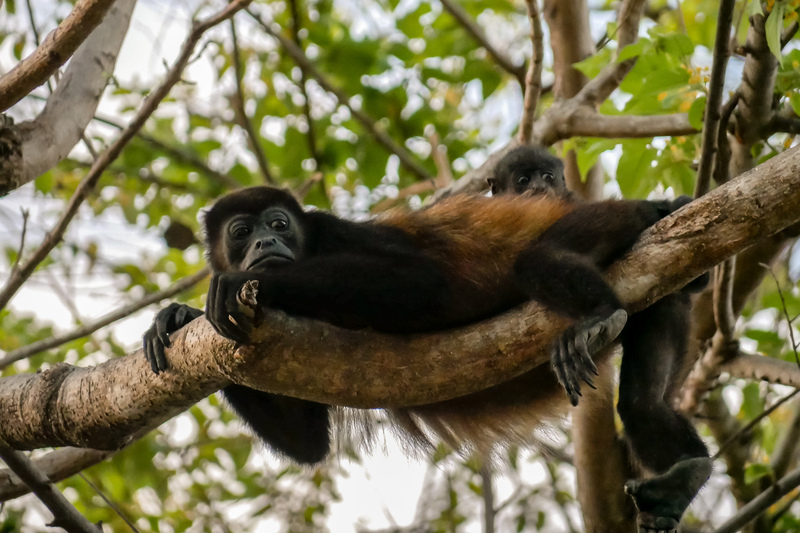 There was a baby howler monkey clinging to its momma’s back. I couldn’t believe it. Such a primal moment, and I couldn’t have been more excited to capture it. Looking back at the photo, the momma monkey did not seem amused. The baby on the other hand look so shocked, with its eyes opened as wide as they’d go. I can only imagine how tightly it was gripping onto its mom’s back, clinging for safety. And just like that, we rarely saw another monkey for the rest of the trip. We heard them, but never got this close again. It just goest to show you, capture the moment while you can, and never bank on it happening again or at a later time!